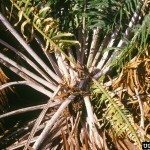 Could my sago palm be yellowing from too much watering? I replanted it and perhaps watered way too often over 2 weeks following replant. Now over the next 3 weeks I've got mature and new leaves yellowing. Yes, yellowing leaves can be signs of overwatering or under watering. There is little to do except allow the plant to dry out. You will need to keep an eye out for root rot.